The Zyxel ES3500 Series Fast Ethernet layer 2 switches are specifically designed for small and medium-sized businesses to deliver valuable Ethernet services to customers and employees. With Gigabit SFP uplinks and robust access control functions, businesses can easily extend network topologies and fulfill different customer needs. The complete ES3500 Series also supports IPv6 for trouble-free future network expansions. 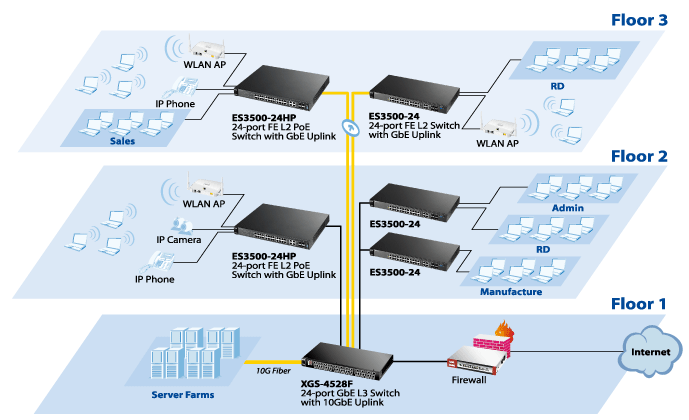 The ES3500 Series consists of three layer 2 switches with Gigabit uplinks: the ES3500-24, ES3500-24HP and ES3500-8PD. The ES3500-24 has 24 Fast Ethernet ports; the ES3500-24HP features 24 IEEE 802.3at PoE Plus ports; while the ES3500-8PD is an 8-port Fast Ethernet switch with a special powered device (PD) design, enabling it to be powered via an external power adapter or a PoE connection. Avoiding subscribers from affecting each other on a shared network or device is a major concern for SMB networks. The Zyxel ES3500 Series offers a complete set of security features to protect user data while administrating network traffic. It features port security, 802.1X authentication and RADIUS accounting to prevent unauthorized access and provide powerful access control for converged networks. The ES3500 Series features a multilayer (L2/L3/L4) ACL suite of sophisticated policy-based control mechanisms, which can be used to help SMBs prevent abnormal or illegal access. Policies can be defined via a GUI or CLI to deny packets based on source and destination MAC addresses, IP addresses or TCP/UDP ports. The ES3500 Series is an ideal solution for SMBs that need to establish a converged network across long distances or multiple floors. It supports dual-speed (100/1000 Mbps) SFP uplinks, providing more options in establishing fast and reliable connections in distributed and long distance deployments. Supporting Digital Diagnostics Monitoring Interface (DDMI), the ES3500 Series allows administrators to easily detect packet loss from transceivers and aging cables to avoid unstable network service, lower maintenance overhead and boost business productivity. The ES3500-8PD features a special powered device design, making it easy to install in places where power outlets are not available. Users have the option of powering the switch with either the external power adapter or via a Power over Ethernet (PoE) connection, with the PoE input prioritized when both are available. The ES3500-8PD also comes in a fanless design that ensures silent operation in small or quiet office environments. The ES3500-24HP supports the IEEE 802.3at PoE Plus standard to ease the installation of powered devices in challenging spaces such as ceilings or walls. The power supply of up to 30 watts per port allows the ES3500-24HP to power PoE-enabled WLAN APs, VoIP phones and IP surveillance cameras through CAT-5 cables of less than 100 meters (300 feet) in length. The ES3500-24HP also features the intelligent PoE consumption mode, which automatically detects the amount of power each powered device needs and supplies power accordingly for more efficient use of power resources and better ROI for businesses. Designed to protect business investment, the ES3500 Series features a complete set of IPv6 host management functions to guarantee smooth IPv4-to-IPv6 migration. This feature set benefits high-density Fast Ethernet deployments, making the ES3500 Series perfectly suitable for both core and edge networks. Download the Zyxel ES3500 Series Datasheet (PDF).